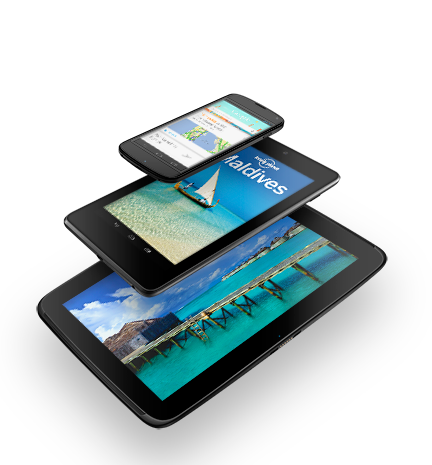 Today, we’re excited to announce three great new Nexus devices … in small, medium and large. And they all run Android 4.2, a new flavor of Jelly Bean—which includes the latest version of Google Now and other great new features. Nexus 4 is our latest smartphone, developed together with LG. It has a quad-core processor which means it's super fast, a crisp 4.7" (320 ppi) display that's perfect for looking at photos and watching YouTube, and with wireless charging you just set the phone down on a charging surface to power it up, no wires needed. While Nexus 4 is incredibly powerful under the hood, it also features the latest version of Jelly Bean, Android 4.2—the simplest and smartest version of Android yet. Starting with the camera, we've reinvented the photo experience with Photo Sphere, which lets you capture images that are literally larger than life. Snap shots up, down and in every direction to create stunning 360-degree immersive experiences that you can share on Google+ with friends and family—or you can add your Photo Sphere to Google Maps for the world to see. Android 4.2 brings other great goodies like Gesture Typing, which lets you glide your finger over the letters you want to type on the keyboard—it makes typing fast, fun and a whole lot simpler. Android 4.2 also adds support for wireless display so you can wirelessly watch movies, YouTube videos and play games right on your Miracast-compatible HDTV. 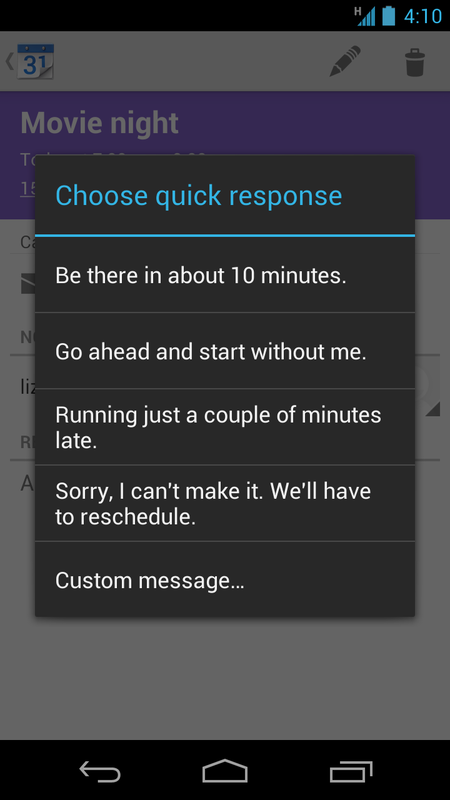 Learn more about all of the new features in Android 4.2, Jelly Bean, here. We designed Google Now to make life simpler by giving you the right information at just the right time in easy to read cards, before you even ask. And the feedback has been awesome. So today we’re adding more cards that we hope you’ll find useful. Flight information, restaurant reservations, hotel confirmations and shipping details—how often have you found yourself wading through your email to get this information at the last moment? So next time you book a table for dinner, you’ll get a reminder with all the details without ever having to lift a finger. You’ll also get cards for nearby attractions, interesting photo spots, movies times at nearby theaters or concerts by your favorite artists. Nexus 7 brings you the best of Google–YouTube, Chrome, Gmail, Maps–and all the great content from Google Play in a slim, portable package that fits perfectly in your hand. To give you more room for all that great content you can now get Nexus 7 with 16GB ($199) or 32GB ($249) of storage. But we also wanted to make this highly portable tablet even more mobile. So we added HSPA+ mobile data. Nexus 7 is now also available with 32GB and HSPA+ mobile ($299), which can operate on more than 200 GSM providers worldwide, including AT&T and T-Mobile in the US. Nexus 10 is the ultimate tablet for watching movies or reading magazines. We wanted to build a premium entertainment device, so we partnered with Samsung to do just that. Nexus 10 is the highest resolution tablet on the planet with a 10.055" display at 2560-by-1600 (300ppi), that's over 4 million pixels right in your hands. It comes with a powerful battery that will get you up to nine hours of video playback and more than 500 hours of standby time. With a set of front-facing stereo speakers, you can watch movies right from your Nexus 10 and they simply sound awesome. But what makes Nexus 10 unique is that it's the first truly shareable tablet. With Android 4.2, you can add multiple users and switch between them instantly right from the lockscreen. We believe that everyone should have quick and easy access to their own stuff -- email, apps, bookmarks, and more. That way, everyone can have their own home screens, their own music, and even their own high scores. We’ve recently added a ton of great new entertainment to Google Play, such as movies and TV shows from Twentieth Century Fox. Earlier this year we expanded our service beyond movie rentals and now you can purchase movies and build a library of your favorites in Google Play. Today we’re bringing movie purchasing to more countries - Canada, the U.K., France, Spain and Australia. We’re also excited to announce two new partnerships. We’re now working with Time, Inc. to bring you even more magazines like InStyle, PEOPLE, TIME and others. And we’ve partnered with Warner Music Group who will be adding their full music catalog with new songs coming each day. We’re now working with all of the major record labels globally, and all the major U.S. magazine publishers, as well as many independent labels, artists and publishers. On November 13, we're bringing music on Google Play to Europe. Those of you in the U.K, France, Germany, Italy and Spain will be able to purchase music from the Google Play store and add up to 20,000 songs—for free—from your existing collection to the cloud for streaming to your Android devices or web browser. We’re also launching our new matching feature to streamline the process of uploading your personal music to Google Play. We’ll scan your music collection and any song we match against the Google Play catalog will be automatically added to your online library without needing to upload it, saving you time. This will be available in Europe at launch on November 13 and is coming to the U.S. soon after. This will all be for free—free storage of your music, free matching, free syncing across your devices and free listening. Nexus 4: 8GB for $299; 16GB for $349; available unlocked and without a contract on 11/13 on the Google Play store in U.S., U.K., Australia, France, Germany, Spain and Canada. The 16GB version will also be available through T-Mobile for $199, with a 2-year contract (check here for more details). Nexus 7: 16GB for $199 and 32GB for $249; available in U.S., U.K., Australia, France, Germany, Spain, Canada and Japan, and also through our retail partners Gamestop, Office Depot, Office Max, Staples and Walmart. Nexus 7 with 32GB and mobile data: $299 and unlocked, on sale 11/13 in the Google Play store in the U.S., U.K., Australia, France, Germany, Spain and Canada. Nexus 10: 16GB for $399; 32GB for $499; available on 11/13 in the Google Play Store in the U.S., U.K., Australia, France, Germany, Spain, Canada and Japan. You'll also be able to purchase the 32GB version in over 2,000 Walmart stores in the U.S.
A Nexus device is much more than simply a phone or tablet. It’s your connection to the best of Google—all of your stuff and entertainment, everywhere you go with no hassle. Now you have three new Nexus devices, a new improved version of Jelly Bean and more entertainment than ever before—all available on Google Play. The playground is open. People increasingly have more than one device, and they switch between them many times a day. Nexus—Google’s hardware line for Android devices—gets rid of the hassle. Just sign in with your Google Account and everything is there ready to go, whatever device you’re using: photos, emails, contacts, bookmarks, even your entertainment on Google Play. In addition, we also expanded the sync period so you can review past events from up to one year ago directly on your device. 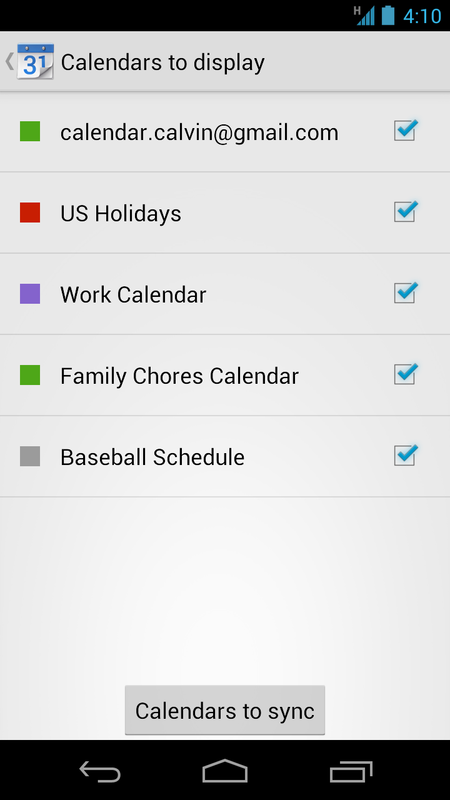 Download Google Calendar on Google Play today for devices running Ice Cream Sandwich (4.0.3+) or Jellybean. Use the Google Feedback feature in the app to let us know how we can make Calendar work better for you!